Handcrafted from black, vegetable dyed cow hide. The edge is coated and polished. Perfect fit for any pocket, front or back, tight or loose, without bulk. 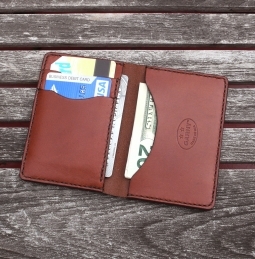 It will hold credit cards, drivers license etc. 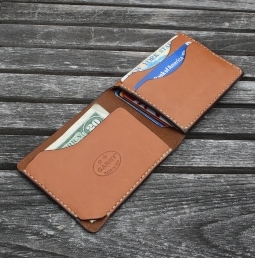 4 compartments: 2 card pockets on front , 1 pocket for $ bills on the back and more storage in the middle to hold about 8 credit cards. Hand stitched with waxed linen thread.